My first adventure in printing and zine making consisted of participating in my friend Simon’s project “things we’re not going to talk about” in February 2012, specifically its first issue, “hearts i tried not to break but did”. 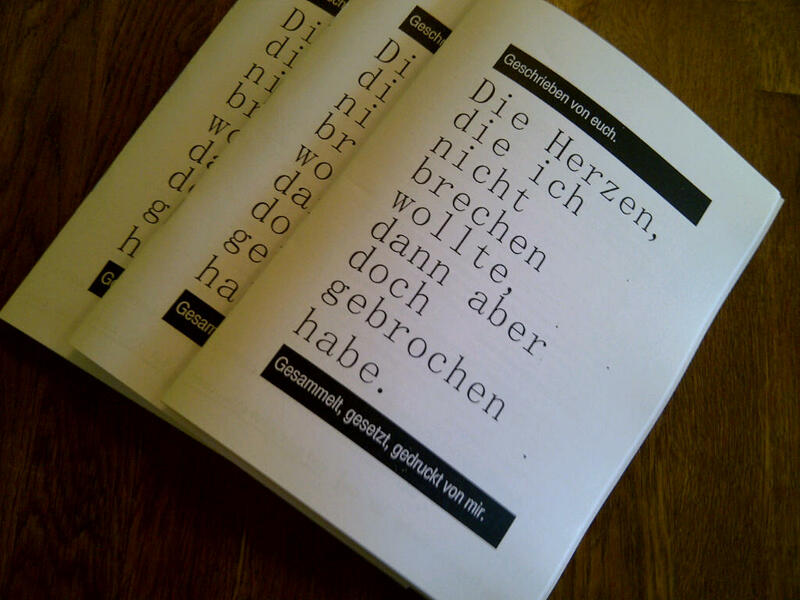 In September 2012, I decided to essentially steal his idea and collect stories about heartbreak and regret in a zine entitled “Die Herzen, die ich nicht brechen wollte, dann aber doch gebrochen habe”. While he conducted interviews and wrote up the stories himself, I collected anonymous contributions written by the participants themselves. I then edited and illustrated them, and printed and saddle-stitched them in my university’s computer lab. I printed two b/w runs of 30 copies, 7 of which I was able to put up for sale in Der Büchersegler, a local independent bookshop. The rest was sold in person or through the online store on the project’s website. In March 2014, I co-organised a student reading at a local bar here in Edinburgh, and a team of us put together a zine to go along with the event. We printed and saddle-stitched a colour print run of 99 copies, which we sold at the event. A pdf is also available. In May 2016, some friends and I co-produced a full-colour zine called “Guns Don’t Kill People”. I also printed 50 copies of a short b/w comic called “The Anteater”, which was my first adventure in illustration. Do get in touch if you’re interested in purchasing a copy!